Stocks Unleashed: Kumpulan Fima (RM1.63; Target: RM2.20): Highest quarterly earnings, steady! Kumpulan Fima (RM1.63; Target: RM2.20): Highest quarterly earnings, steady! Kumpulan Fima's quarterly results were out just now. Its earnings remained steady on an uptrend. 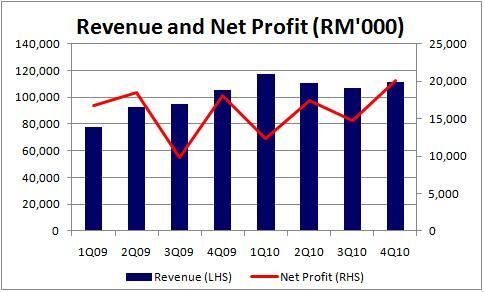 Net profit rose to RM20.07 mil or EPS of 7.6 sen, a +35% q-o-q and +10.8% y-o-y. The increased earnings were contributed by higher earnings of all business segments, i.e. plantation, production & trading of security documents, bulking and food divisions. Net cash rose from RM120.7 mil in 3Q2010 to RM153,4 mil in 4Q2010 (calendar year), allowing the company plenty of flexibility for acquisitions or further expansion of its plantation business. Trailing 12M net profit was RM64.6 mil or EPS of 25 sen, thus PER 2010 stood at only 6.6x, supported by net cash per share of 58.3 sen. Its share price movement had been rather lethargic lately, following the trend of the general market. I noticed that its shares have been moving rather close to the market (as opposed to TWS which could run quite contrary to market movement). Perhaps it could only rebound meaningfully when the general market is more favorable. As compared to Tradewinds, KFima's earnings growth is only 'decent' and rather predictable which probably led to its unexciting share price movement. It could also be due to the declining palm oil prices which plagued the plantation stocks, KFima is no exception. 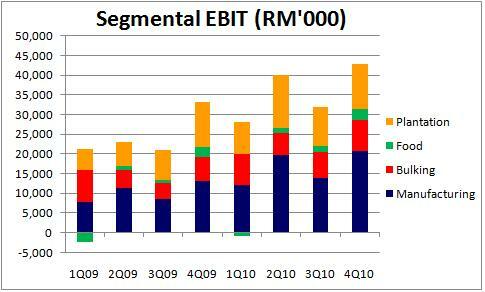 In terms of valuation, putting an 8x PE to its EPS of 25 sen (most likely could earn more than that in 2011) will yield a share price of RM2.00, a 23% upside. I believe it should be trading more than 8x PE. Perhaps 10x should be a better valuation for it in view of its steady earnings growth backed by strong net cash position (reminds me of HSL). For now, I am putting more chips in Tradewinds (M) as this company's businesses are superior to that of KFima, and I would say, can easily surpass Kulim. Yet, it's trading at a lower valuation than KFima in terms of PE. Looking at Tradewinds trading volume, seems that big players are coming in. Such an expensive stock (in terms of share price) with hundreds of lots queuing up to buy is something worth taking a look. Nonetheless, its shares are more volatile. You must have enough funds to stomach the high volatility. It could end up being the top gainer, and also being the top loser. Hahaha. But it's an upward trend. Ok. Sorry, digressed already. Back to KFima. Have a look at the charts below. For previous posts on KFima, click here. Kfima is one of my favorite stocks and hence I can't resist adding my input here. Its revenue and net income grew steadily for the past few years. Its balance sheet is spotless. More important it produces more than RM100 in free cash flows in the last 12 months, giving a price-to-FCF of less than 4. It should not be affected too much by the cyclic CPO price decline as PBT for plantation is less than 30%. ROE good at 15 and ROIC about 30! With these excellent measures, Kfima should not be selling at PE less than 10. In my opinion, even a PE of 15 is not expensive for Kfima.